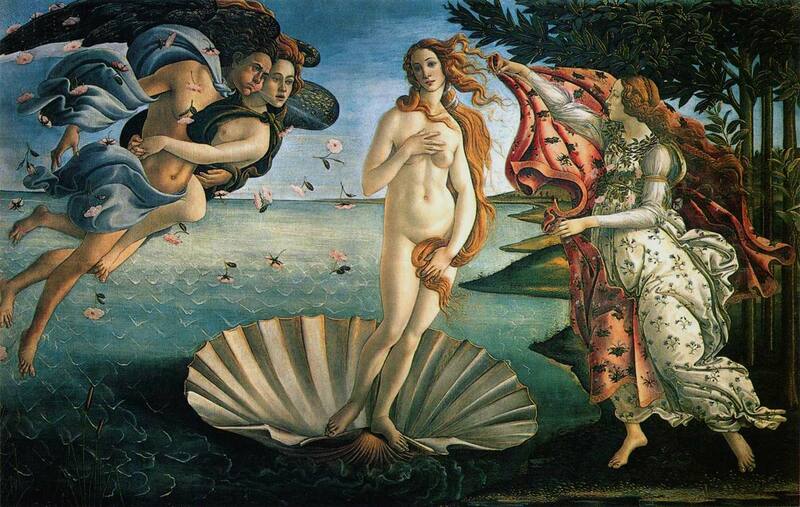 Botticelli was thinking about Spa Sunday when he painted this. So my New Year’s Resolution was to take extra special care of my hair, skin, and nails (thus, Spa Sunday was born! )–but really it’s my nails that need the most help. They sometimes look live I’ve been living in the wild, killing prey with my bare hands and digging Autumn-sized lairs under the roots of trees (I often envision myself having to survive all alone in the wild, just for light amusement, but that’s another post). So the first order of business on Spa Sunday is to clean, trim, and file those suckers. You’ll do the rest in a minute. 2. The sumptuous hair mask. I do clean and brush my hair fairly regularly, but I sort of neglect it otherwise. The time had come to do a little something extra, so I mixed up an olive oil and honey hair mask (easy recipes for this and other concoctions below). It adds lots of shine and softness. Pour it all over your head and massage deeply into scalp and roots. It’s probably going to drip into your eyelashes or run disconcertingly down into your armpit. Ignore the urge to leap in the shower and scrub it off with a Brillo pad. Just keep on rubbing till you look like this. Then wrap it all up in a towel (if you can get hold of the ridiculously amazing Turbie Twist, I highly recommend) and wash your hands till your fingers stop sticking together. 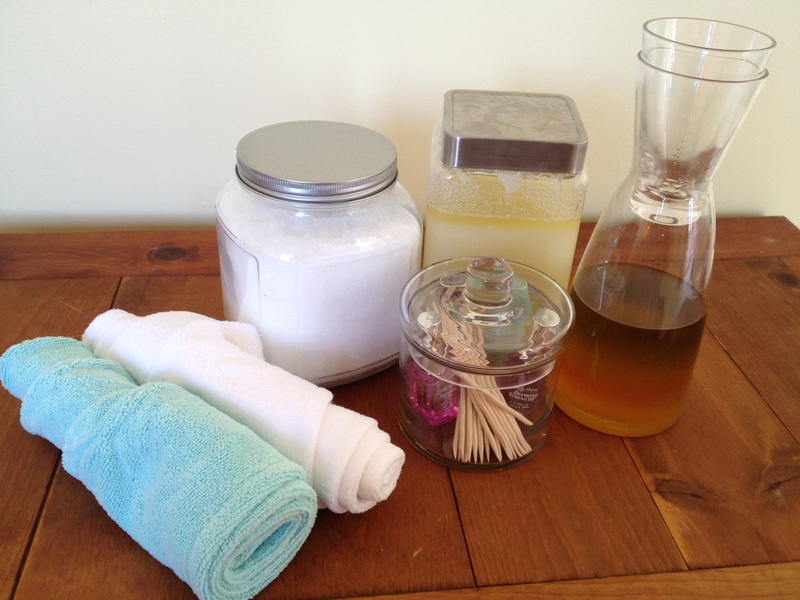 Start running your bath water (see item 4) and add the bath salts. While that’s going, give yourself a quick face wash to remove impurities and turn your sink faucet on super hot. Lean over the sink with a towel over your head so you trap all the steam. You might feel like you’re going to die, or at least I did, since breathing in steam gives me a thick, panicky feeling in my throat –but stick to it for a few minutes because this opens your pores. We’ll continue the facial in just one sec. Head for the tub with a jar of sugar scrub, your favorite facial moisturizer, and an orange wood stick (you know, that thingy they use at nail salons). Once immersed, massage the sugar scrub into your face, hands, feet, elbows, knees, and any other bits you care to soften up. Rinse the scrub off your face with warm water first, and then follow up with a splash of cool (I did all this while my bath was still filling up). The chilly water closes up your pores and then you can slather on a dab of face lotion to seal the deal. Next, proceed to soak for a while, making sure to get your fingers and toes fairly raisin-y. Sip a glass of wine, listen to some Kenny G, what have you. Finally, just before you wind things down, push your softened cuticles back with the stick. It’s time to shampoo your hair and rinse off the sugar granules lingering in the, er, creases. Use cool-ish water (or lukewarm, you weenie) for this stage–it restore the tissues, as Bertie Wooster would say. You know what to do here. Report back when your hair doesn’t smell like Italian food. I hope for your sake that you have a nice, big, fluffy towel or robe to wrap yourself in. A thin, scratchy one is no good–that would be like topping a chocolate-dipped ice cream cone with a stick of celery. Anyway, snuggle into your plushest towel and sit in your comfiest chair. Bring along lotion and some nourishing nail serum for your hands and feet. Moisturize yourself into a state of bliss. The end. My Spa Sunday supplies (bath salts, sugar scrub, and hair mask from left to right).